An advantage of winter planting is that you can buy young trees ‘bare-root’ more cheaply and with a greater range of varieties than pot-grown trees. Bare-root simply refers to the fact that they are grown on in open fields and lifted (dug up) just before delivery to you. The roots are protected but often just with a hessian or plastic sack. The trees need to be planted soon after arrival and the roots kept moist and frost free. The bare-root season is Nov-Mar but order early especially for the less common varieties as there is a finite stock of trees grown each year and they take 3-4 years to prepare. Most fruit trees are “grafted” with the top growth determining the variety e.g. Apple ‘Blenheim Orange’, Pear ‘Conference’ and the roots determining the vigour and size of the tree. Your first decision is the variety: flavour and texture of the fruit is the usual priority and it is often nice to grow one that is not widely on offer in the supermarkets. Many older varieties are great for garden growing but not financially viable for mass production. Specific rootstocks have been developed since the 1920s to create dwarf, medium and large orchard trees. Each rootstock has a ‘name’, usually a code. M27 is a rootstock used for apple trees reaching only 2m tall often in containers, MM106 is good for espalier or fan trained apples or a standard tree 4-5m tall. Pears usually use ‘Quince A’ for weaker growing varieties and ‘Quince C’ for naturally more vigorous varieties, both end up 4-5m as a good garden tree and suitable for training. ‘Colt’ is recommended for Cherries giving a tree 4-5m tall and free fruiting. 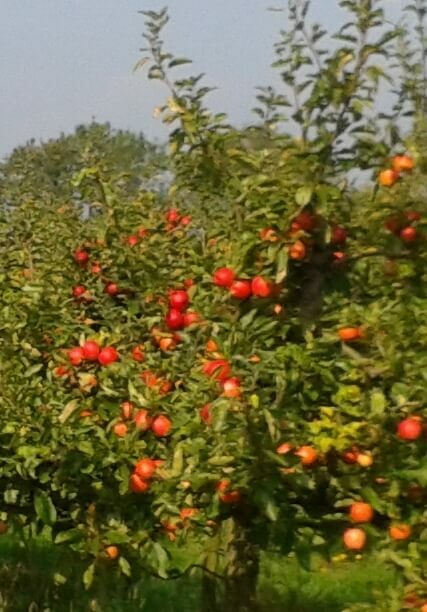 Look forward to fresh picked fruit next summer by choosing and planting a tree this winter.